Handouts discussing the major points of the structure and jurisdiction of the US Supreme Court. I used various AP study resources to create this document.Fits on 8.5 x 11 paper.Color and black and white versions included. 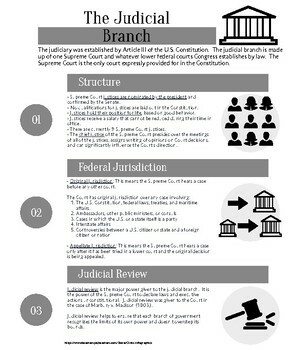 A handout discussing the major points of the structure and jurisdiction of the US Supreme Court. I used various AP study resources to create this document. Black and White for easy printing.